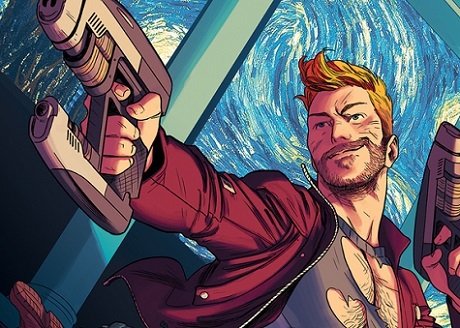 Now Star Lord #1 will be in comic book stores this week from, newcomers to the world of Guardians of the Galaxy, Chip Zdarsky (Archie, Jughead) and Kris Anka (X-Men, Captain Marvel). This is definitely an original plot synopsis, as we know Peter Quill was born on Earth, but he’s been away for a long time. How does a man go from soaring through the stars as the legendary Star-Lord to living with his feet planted firmly on the ground on Earth? What kind of job options are available for a guy whose CV mostly consists of ‘guarding the galaxy’? One thing is certain, Earth has a new guardian. Also, a new bartender. The character first appeared in Marvel Preview in 1976, but he did not join the Guardians of the Galaxy until the team’s revamp in 2008 (Annihilation: Conquest). Star-Lord has headlined his own independent series before, in Legendary Star-Lord, but this is the first examination of Peter Quill/ Star-Lord whilst living on Earth semi-permanently. It’s a neat idea and a chance for for the writer Chip Zdarsky and artist Kris Anka to portray the some time Guardian’s leader in circumstances that we don’t usually see him in. Now Star-Lord will be published by Marvel Comics on December 21st.